COLORADO SPRINGS, Colo. (Feb. 1, 2016) – In December 2015, SpaceX, a known pioneer in the space industry, successfully landed the first stage of its Falcon 9 rocket. The Falcon 9 left Cape Canaveral in Florida, delivered 11 satellites to orbit and historically landed the first stage minutes later. For that achievement, the Space Foundation has selected SpaceX to receive one of its top honors, the 2016 Space Achievement Award. “Space is a risky business, but SpaceX continues to push the envelope in innovation, moving humanity forward. The work being done by SpaceX will reduce cost and overhead for space travel, making exploration more accessible,” said Space Foundation Chief Executive Officer Elliot Pulham. The Space Achievement Award recognizes individuals or organizations for breakthrough space technology or critical milestones in the evolution of space exploration and development. The 2016 Space Achievement Award will be presented on April 11 during the opening ceremony of the 32nd Space Symposium at The Broadmoor in Colorado Springs, Colo., USA. The opening ceremony is co-sponsored by Northrop Grumman, and features presentation of top Space Foundation awards. To be held April 11-14, the Space Symposium is the annual must-attend gathering of all sectors of the global space community. Visit www.SpaceSymposium.org for secure online registration and complete conference information. A discount on standard industry registration is currently available if paid by March 11, 2016.
a.i. solutions; Aerojet Rocketdyne; Aerus; Arianespace, Inc.; ASRC Federal; BAE Systems; Colorado Space Coalition; El Pomar Foundation; FLUOR; Intelsat General Corporation; Lockheed Martin Space Systems Co.; Northrop Grumman; Raytheon; Scitor Corporation; Secure World Foundation; SES Government Solutions; Stellar Solutions; United Launch Alliance (ULA). Aviation Week Network and Space News are official media partners. Founded in 1983, the Space Foundation is the foremost advocate for all sectors of space, and is a global, nonprofit leader in space awareness activities, educational programs and major industry events, including the annual Space Symposium, in support of its mission “to advance space-related endeavors to inspire, enable and propel humanity.” Space Foundation World Headquarters in Colorado Springs, Colo., USA, has a public Discovery Center, including El Pomar Space Gallery, Northrop Grumman Science Center featuring Science On a Sphere® and the Lockheed Martin Space Education Center. The Space Foundation has a field office in Houston and conducts government affairs from its Washington, D.C., office. It annually publishes The Space Report: The Authoritative Guide to Global Space Activity, and through its Space CertificationTM and Space Technology Hall of Fame® programs, recognizes space-based innovations that have been adapted to improve life on Earth. Visit www.SpaceFoundation.org, follow us on Facebook, Instagram, LinkedIn, Pinterest, Twitter, Google+, Flickr and YouTube, and read our e-newsletter Space Watch. 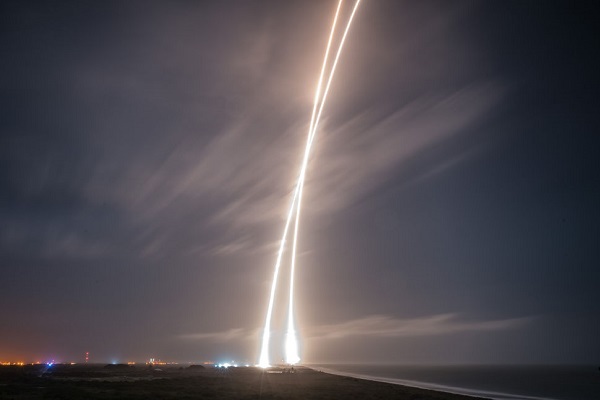 SpaceX also won the award in 2011 for being the first private company to launch into orbit and then recover a spacecraft. Probably because they didn’t put anything in orbit. Who is the Space Foundation again? I must have missed it. Anything but. SpaceX is being honored because it is achieving goals that the “old” space firms would not think to attempt on their own dime.